Don Fitzgerald and Cheryl and Robert Chippindall are behind the project. The project to restore the former Healesville street decorations is nearing completion and it is expected they will back on show in the first week of December. It has been not been an easy road to finish the project and the Rotary Club’s project coordinator, Don Fitzgerald, said that whilst time is tight everything is coming together for the launch. Observant Healesville people will have noticed the roaming team of four contractors repainting the row of antique posts the decorations will sit on. “The decorations are designed to fit exactly on the antique posts on the street and we have had a very helpful response from the council,” Mr. Fitzgerald said. This is part of the Yarra Ranges council support package to the project, which also extends to the erection and removal of the decorations. 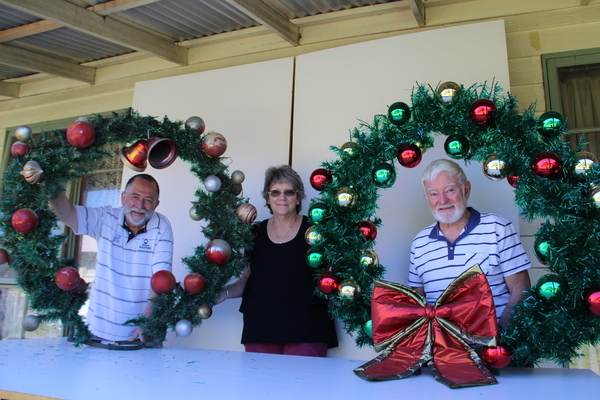 The 25 restored wreaths will adorn every third post and the ones that have been repainted are sparkling, an early benefit to the town of the Rotary Club project. Don Fitzgerald said that the Healesville Rotary and Lions Clubs are absorbing most of the projects cost but there is still a shortfall in funds that they need help in bridging. Whilst he is happy with the initial response from local businesses, he is urging the community to help out with donations, particularly towards the ongoing storage and maintenance costs. Anyone who would like to contribute to the project can contact Don Fitzgerald on 0428 537 846 or through Healesville Rotary.